For those lazy days when you just want to grab some spicy Thai food and a cold beer, Taksura offers just that with no frills. 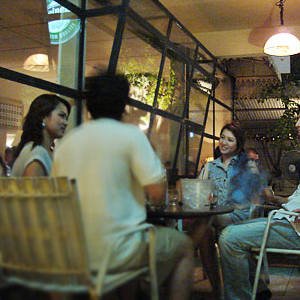 The first of four branches, Taksura caters to an odd mix of backpackers, university students, and hard going regulars. Live guitar music completes the casual atmosphere. Indoor and outdoor seating available. From Ngaamwongwan road, turn right at Pongpet Intersection, go straight on "Liab Klong Prapa" road until the short cut way to Vibhavadi Rangsit road, Turn left into Thetsaban Nimit Mai road, around 100 metres "Taksura Prachachuen" is located on the left hand side.